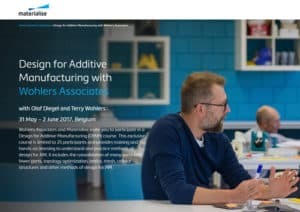 Wohlers Associates and Materialise recently announced a three-day Design for Additive Manufacturing (DfAM) course. This exclusive course is limited to 25 participants and provides training and hands-on learning to understand and practice methods of design for AM. It includes the consolidation of many parts into fewer parts, topology optimization, lattice, mesh, cellular structures and other methods of design for AM. The course is May 31 – June 2, 2017 at the Materialise headquarters location in Leuven, Belgium. Wohlers Associates has twice offered a similar course for NASA Marshall Space Flight Center, which received high marks for its effectiveness. Wohlers Associates is an independent consulting firm that provides technical, market, and strategic advice on the new developments and trends in additive manufacturing, 3D printing, and rapid product development. Most TEAMM Collaboration Network members are familiar with the eponymous Wohlers Report that is published annually. This special, advanced course from Wohlers and Materialise is aimed at industry professionals. For the student or teacher seeking lessons that range from intro to intermediate needs, head to the TEAMM Modules page where you’ll find specific curriculum to help in your additive manufacturing courses. For example, two intermediate courses: 3D Printing In The Classroom and 3-D Spatial Visualization Skill Building for Additive Manufacturing are available for download as PDF, PPT or ZIP files. More Additive Manufacturing and Materials Science course resources are available at the Materials Education site.